Cuba is synonymous with a few things in everyone’s mind, and whether or not you’re a commie, a weak-willed socialist-sympathizing pinko, or even a right-wing pseudo-fascist, there is much to admire about that politically-isolated island nation. It’s long and storied colonial history, the amazing preservation of its architecture and fleet of intact 1950s Chevrolet, its magnificent music – most famously heard in Buena Vista Social Club, it’s eponymous and world-famous cigars (supposedly, though logistically it seems unlikely, rolled on the thighs of a virgin), it’s many and beautiful beaches, it being the location of a mafia meeting famously portrayed in The Godfather, pt II, and, most significantly to us folks here at We Are Never Full, a myriad of delicious dishes made from the king of meats, pork. As regular readers will know, we are obsessed with pork, especially roasted pork, so while we’ve yet to make any more than the briefest foray into Cuban food, we definitely intend to compare Lechon Asado Cubano (Cuban Roasted Pork) and Masas de Puerco Fritas (Cuban Fried Pork Chunks) to their Puerto Rican and Colombian counterparts that we have tried, just as soon as our cardiologist deems it safe to do so. In the meantime, we elected to solve our latest leftover roasted pork crisis with Cuba’s other synonymous comestible – the Cuban sandwich. In this case, we used the leftover pork from our Italian-Style Roasted Pork Shoulder with Salsa Verde. And before you start accusing us of going all Everyday Food on you with our recent spate of unbelievably easy recipes, those of you who’ve never had a Cuban sandwich will quickly learn that as far as hot sandwiches go, this is among the best, regardless of how easy it is to prepare. Among the reasons for it being one of the best sandwiches, the double-hit of pork products probably features most prominently, but the gooey cheese mixed with the crunchiness of warm pickles is a combination which is hard to beat. Add to it that there are no chunks of tomato or hunks of lettuce to cause what Anthony Bourdain calls “tectonic dynamism” between layers of filling when you take a bite, and the cooking process ensures that it is a suitable girth for easy mouth-insertion, the outcome is a delicious, unctuous sandwich that is also a joy to eat. Now, I’m describing our Cuban sandwiches, and we did quite a lot of research before making them to ensure we were making them at least reasonably authentically, but, as with many famous dishes, there is a whiff of controversy surrounding the ingredients of a sandwich Cubano. Apparently, in Tampa, Florida, it is common to find Genoa salami in your Cubano alongside the roast pork and honeyed ham, whereas in Miami that would be frowned upon. Similarly, in Key West, you’ll often get lettuce and tomato in the sandwich too, though again in traditionalist joints in Miami and Puerto Rico (home to many Cuban emigres) these would be on the side, if served at all. And, finally, lest we be deluged with complaints, we used Dijon mustard instead of the standard yellow mustard, partially because we prefer Dijon mustard, and partially because we didn’t have any yellow mustard at the time. Slice loaf open end-to-end and spread one side with mayonnaise and the other with mustard. 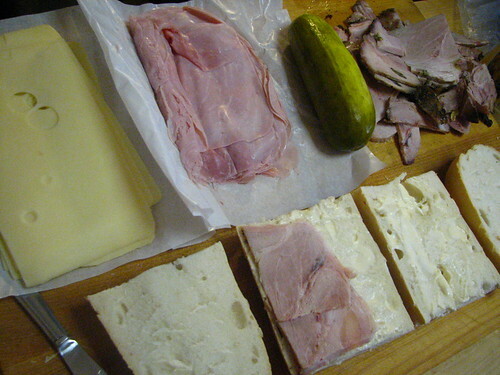 Then, arrange roast pork slices on mayonnaise-d side, repeat with ham, then cheese, and finally pickles before putting mustard-coated bread on top. Cut loaf in half (to make two sandwiches) and wrap loaf in foil. Place on a baking sheet and put your heaviest (oven-proof) iron skillet on top. Put in the oven and give it 20-30 minutes depending on how crispy you like your bread. Cut in half again (traditionally, it’s cut into triangles, or on the bias) and serve immediately with your favorite cold beer or, if you must, soda. For more recipes and fun with roasted pork and other wondrous porcine dishes, go to www.weareneverfull/recipes. 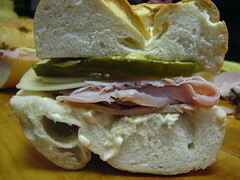 I am SUCH a sandwich addict it is just rediculous, people actually groan now when I say I’m going to make one. Funny how they never complain when they are eating it? This looks like a fine sandwich, very fine indeed! Claudia, you’re dead-on. the bread is the key to any sandwich, and in this case, Cuban-style bread made the difference between a pseudo-Cubano and a Cubano-autentico! Helen, i’m so with you on this one. I always said that if there was one food that I had to choose to eat for the rest of my life and I was allowed nothing else, it would be sandwiches. Nothing else is so simple, yet the combinations of bread, spread and filling are infinite. Delicious! There’s a Cuban sandwich place near my office here in Chicago. I know where I’m going for lunch tomorrow! Yummm! I finally found a little shack (literally) in Manhattan that serves a good sandwich Cubano, but I’m definitely going to have to try this the next time I have some roast pork sitting around. oh thanks for beating me, yet again to something native to me! LOL! great looking sandwich chica!! i don’t do pork, but i guess i could get back to making this staple… and so what if it’s everyday food! my mother makes a mean a** pan cubano! ok. i love you guys. There’s a funky hole-in-the-wall in DUMBO, Pedro’s that has a great cubano (and $3 beers), but yours looks better. Cheers! how I love a good Cuban sandwich every now and again. I cannot wait until the travel restriction to Cuba is lifted and we can make our way there for a true taste!! 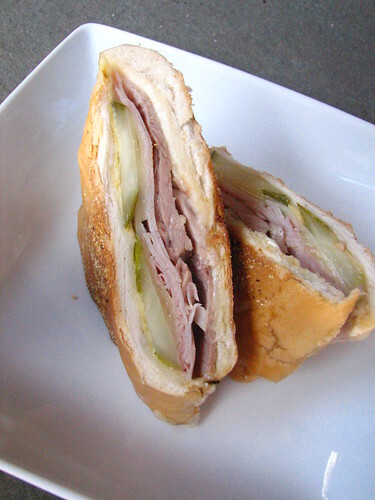 Pingback: Cuban Sandwiches | Find. Boom. You got it. ← Newsflash! Worlds Longest BBQ Record BROKEN! Shockwaves Sent Throughout the World and Sadness Throughout the Vegan/Veg Community.